INTERESTED IN SAILING, BUT DON'T WANT TO COMMIT TO A CLASS? OUR CERTIFIED CAPTAINS WILL TAKE JUST YOU AND YOUR PARTY OUT ON THE WATER FOR A FUN, PRIVATE SAILING EXPERIENCE. YOU CAN LEARN A THING OR TWO ABOUT SAILING, TAKE THE HELM OR JUST SIT BACK AND RELAX. AS THESE ARE PRIVATE EVENTS, WE REQUEST ADVANCED NOTICE OF 1 WEEK SO WE HAVE AMPLE TIME TO SCHEDULE A BOAT AND CAPTAIN. THERE IS NO BETTER WAY TO EXPERIENCE SEATTLE THAN VIEWING IT FROM THE WATER WHILE ENJOYING SOME OF THE MANY TREATS THAT PIKE PLACE MARKET HAS TO OFFER. 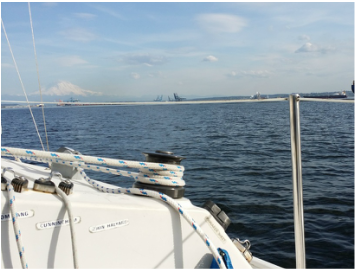 WHILE CRUISING OUT OF TACOMA, YOU WILL ENJOY STUNNING VIEWS OF THE OLYMPIC MOUNTAINS, SAIL BY DASH POINT AND POINT RUSTON. GIG HARBOR IS ONE OF PACIFIC NORTHWEST'S HIDDEN GEMS. HISTORICALLY A FISHERMAN'S VILLAGE, GIG HARBOR STILL HAS THAT SLEEPY, SMALL TOWN FEEL WITH MT. RAINIER TOWERING OVER IT. YOU CAN BROWSE BOUTIQUE SHOPS AND GRAB A BEER OR BURGER AT THE FAMOUS TIDES TAVERN. IF DRINKING ALCOHOL, YOU WILL BE UNABLE TO SAIL THE BOAT.